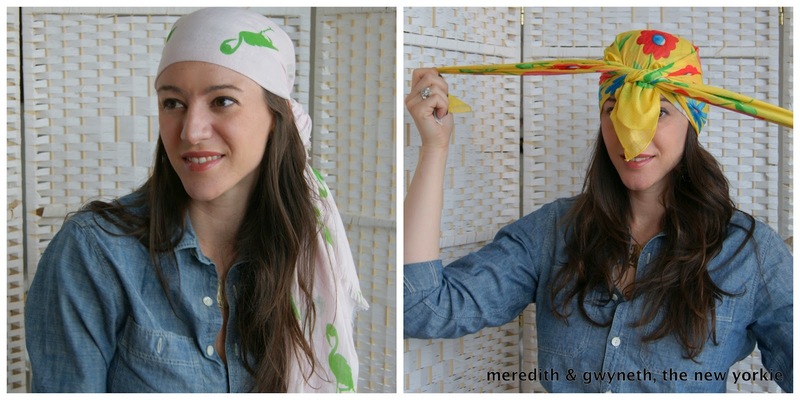 I came across this great post for 2 ways to tie a headscarf by Meredith of Meredith and Gwyneth, The New Yorkie. 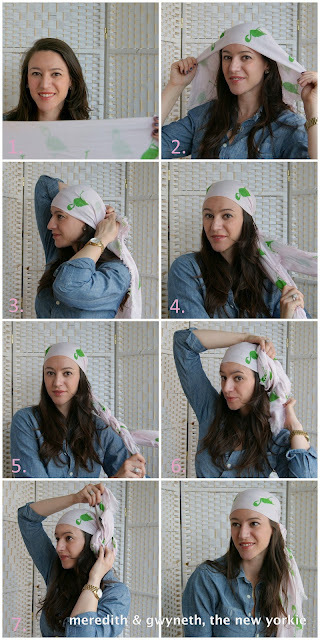 If you are going through chemotherapy and have lost some or all of your hair this is a great way to make it through the summer months looking effortlessly chic. This is also the perfect "work-around" for hair that is thinning in front and around the top but with longer hair hanging down in back. Many women start to notice changes in the density of their hair as they approach 40 regardless of cancer or chemotherapy so this is a simple solution for anyone. 1. Wearing a scarf around your neck in the summer can get a little toasty, but leaving accessories to be lonely in the closet is just mean. Now that you (and your pooch) are on board, go shop your closet for your favorite rectangular scarf and your favorite square scarf, and Gwyneth and I will show you two stylish and no-slip ways to wear them. 1. 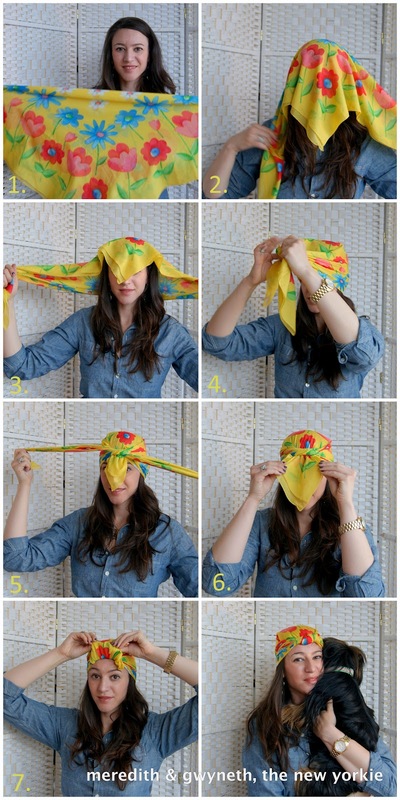 Fold your scarf in half, width-wise. 2. Drape over the top of your forehead and head. 3. Tie the ends in a knot behind one ear. 4. Separate the two loose ends. 5. Twist the two loose ends. 6. Wrap the twist around the knot you tied in Step 3. 7. Loop the end of your twist through the loop you made and pull to secure. 2. Drape over your head, so the point is in the front. 3. 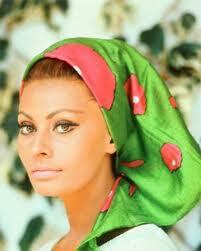 Adjust so the long side of the scarf rests at the nape of your neck. 4. Pull the ends towards the front. 5. Twist the ends around each other, over the point in the front, then back around to tie in a knot at the nape of your neck. 6. 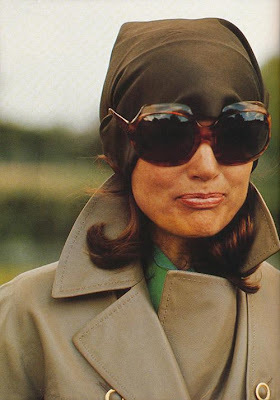 Gather the point of the scarf, so it is the width of a large knot. 7. Roll the point back, tucking it under itself to secure. Thank you so much for sharing our tutorials here, Wendy! My Mom just finished her 6th round of chemo, and she's rocking these styles now too - I think she looks so chic and gorgeous! I love, love, love this blog and will be sharing it with her today! Lots of inspiration here! Thanks again Meredith (and of course, Gwyneth!) and sending lots of support and healthy thoughts your mom's way. Hopefully, she'll find some other chic inspirations here to go with the awesome new look you've provided her with! p.s. I love your blog too...been following it for a while. Wow! thank you for so much inspiration! Great job!!! Wonderful!!! what an inspiration!! !